Veteran litigator Benjamin Chew joined the international law firm of Brown Rudnick LLP on April 20. True to his reputation as a tireless and dedicated litigator, he spent the day in court, representing clients. Mr. Chew joins the firm as a partner in its litigation practice and will work from its Washington D.C. and Irvine, California offices. 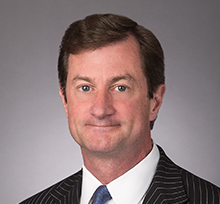 He joins Brown Rudnick from Manatt Phelps & Phillips where he was a partner. With more than 25 years of courtroom experience, Chew handles a variety of high-stakes matters throughout the United States and abroad on behalf of eminent individuals, businesses, trade associations and foreign governments. He is a Fellow of the American College of Trial Lawyers. Representation of L-3 Communications and other government contractors in various civil actions. Joseph F. Ryan, Brown Rudnick Chairman & Chief Executive Officer, noted how closely Ben's profile aligns with Brown Rudnick's platform. "Our strategy is to seek opportunities that lend themselves to innovation and collaboration across our platform, and to add strong people to practice areas where we are a recognized leader," Mr. Ryan said. "Ben fits the bill. He is a prominent DC litigator with a growing roster of high-profile matters in Southern California, and adds depth and breadth to our litigation team in these key markets. Further, his extensive experience in Latin America and the Middle East maps directly with our multidisciplinary teams focused on those regions. And he is an exceptionally strong fit for us culturally – clever, original, and inventive. We are delighted to welcome him to Brown Rudnick." Chew also noted his affinity for Brown Rudnick's litigation style. "I have admired Brown Rudnick throughout my career," said Chew. "It has a strong reputation for aggressive, plaintiff side litigation, domestically and internationally. I look forward to growing my entertainment practice with Randy Smithand the great litigators in the Irvine office, and working closely with Ken Weckstein and the Government Contracts team in DC. "On my first day with the firm I engaged with our lawyers in our Washington D.C. and Southern California offices on a significant matter, able to provide my client with seamless, high level service even as I was transitioning," he added. "That's rare and special. I am excited to expand our work at Brown Rudnick." Chew's experience includes counseling clients in legal matters related to class action, intellectual property, government contracts, breach of contract, healthcare, Lanham Act, advertising, Uniform Commercial Code, defamation, products liability, bankruptcy, real estate, employment, insurance, civil rights, fraud, and RICO litigation, as well as in shareholder derivative suits and partnership disputes. He is active in several federal and state courts, including the U.S. District Court, Eastern District, Virginia and the U.S. District Court, District of Colorado. In addition to being named a Fellow of the American College of Trial Lawyers, Ben is recognized in Best Lawyers in America for Commercial Litigation. Ben is committed to pro bono, currently representing an African-American University of Virginia honors student in a civil rights action.